Pre-order The Hotelier’s new LP Home, Like NoPlace Is There and receive an early digital download plus a shirt. Western Mass’s The Hotelier (formally The Hotel Year) will release their second full length on Tiny Engines (Save Ends, Little Big League) February 18th, but you can listen to the record in its entirety while wearing a snazzy new shirt mid-January if you pre-order their record today. 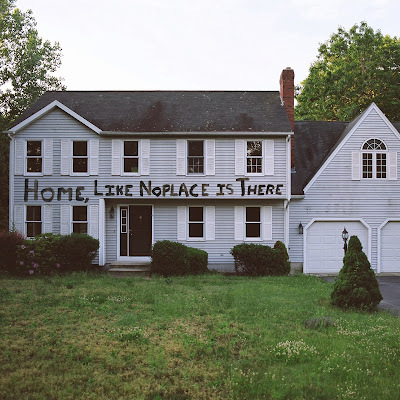 Home, Like NoPlace Is There, which Tiny Engines believes, “…can only be described as anthemic, cathartic rock songs, sent occasionally to delicate and destructive extremes,” is the follow up to the band’s 2011 record It Never Goes Out, which sent them to FEST 12 and the sweet 16 spot of Buzzfeed’s ‘21 Newer Bands You Should Definitely Check Out If You’re Desperately Missing ’90s And ’00s Emo’ list in November of this year. Listen to the first single "The Scope Of All Of This Rebuilding" for hints of mid-era Piebald and later Saves the Day. Tiny Engines is currently taking first pressing pre-orders of limited edition colored vinyl including clear with black smoke, opaque lavender and transparent gold. Heads up, it looks like the pink with white starbursts is already gone. The pink vinyl eludes me once again! Place your order now.